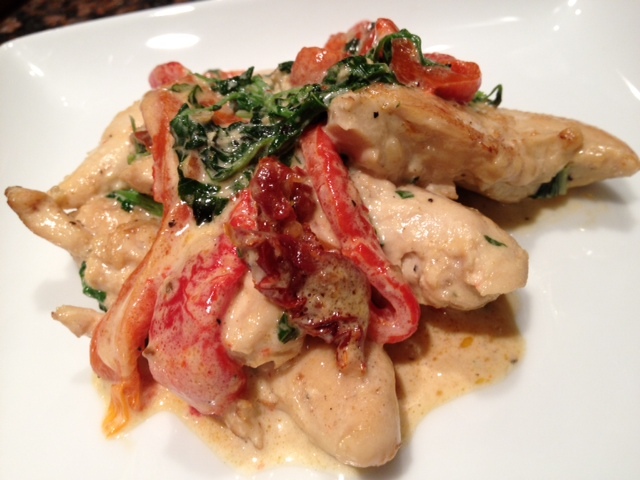 Ingredients for 4: 12-16 chicken tenderloins, 1 cup of heavy cream, 1 whole bell pepper roasted and peeled and sliced in very small strips, 2 tbsp of sun-dried tomatoes ( kept in olive oil), 1 tbsp of fresh chopped basil, 1 cup of fresh spinach, salt and pepper. In a large frying pan, melt the butter and when the butter is sizzling, add the chicken. Saute the chicken for a few minutes on each side ( 1-2 minutes). Season with salt and pepper ( 1/8 tsp of salt, 1/16 tsp of pepper) and remove the chicken from the pan. Add the sun-dried tomatoes and the bell pepper and saute them on a medium heat. Add the cream, and the spinach and bring to boil. Add salt ( 1/8 tsp) and pepper ( 1/16) and stir well. Add the chicken for a few minutes, just enough to cook the chicken through. 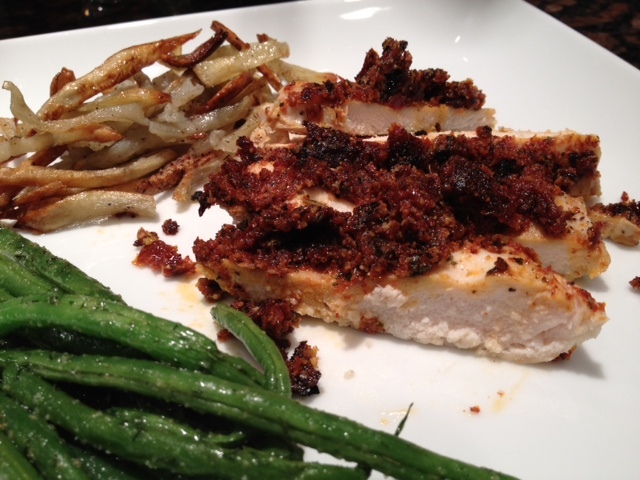 To serve the chicken, place the tenderloins on the plate and spoon a bit of the sauce over the chicken. Eat with rice or pasta. C’est tout!!! On sunday, I usually like to cook a nice gourmet dinner but a lot happened this week-end that made me feel a bit drained. As a result comfort food seemed to be a quick solution to my laziness. 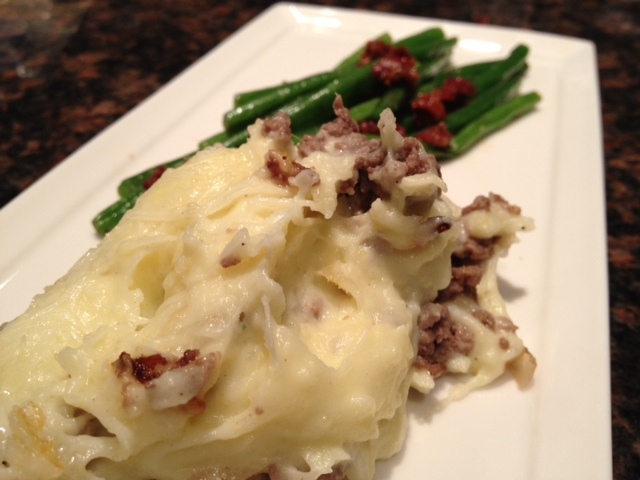 To make the Hachi Parmentier, you will need to make mashed potatoes, you may make them the traditional way cooked in water, or you can cook them in the round mold and save time!!! So peel the potatoes, dice them in small cubes, place them in the round mold. Add 1 tsp of water and a dash of salt, cover the round mold with the octogonal silpat and microwave for 7-8 minutes. Mash the potatoes with a potato press until it is very smooth. Add the warm heavy cream that you would have previously warmed up in the microwave for 2 minutes. Add 1/2 cup of swiss cheese and stir until the potatoes make a smooth “puree”, not too runny and not too thick. You may need to add more cream if needed. Add the garlic salt, the pepper and stir. Add more salt if you deem it necessary. Set aside. Now you need to prepare the beef that will go in the mashed potatoes. Slice and dice your onion. Saute your onion in a frying pan in 1 tablespoon of olive oil. Saute your onion until golden and translucent. Stir in the beef and cook it until it turns brown. Add 1/8 teaspoon of pepper, 1/4 teaspoon of salt and 1/4 teaspoon of fresh parsley ( dry parsley is fine too). Taste and add more seasoning if you think it requires more salt. Empty half of the potato puree in the round mold. Add the cooked beef and cover the beef with the rest of the potatoes. Sprinkle another 1/2 to 1 cup of swiss cheese and cook in the oven at 375 for 15 minutes to brown the cheese. While the hachi parmentier is cooking, prepare the haricots verts. 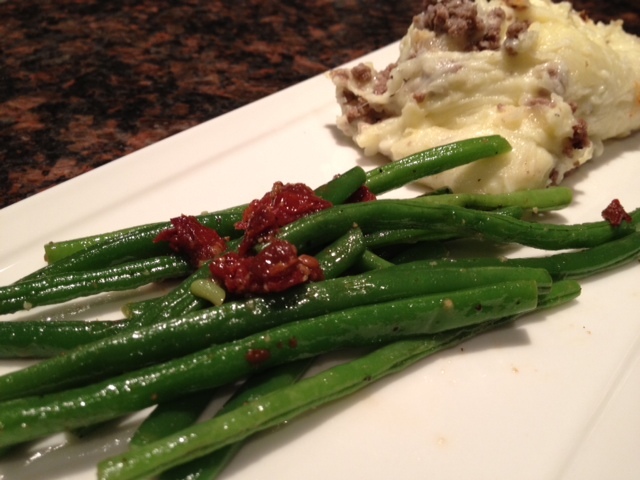 Ingredients for the haricots verts: 1/2 bag of green beans from Costco or 2 small bag of 8 oz. 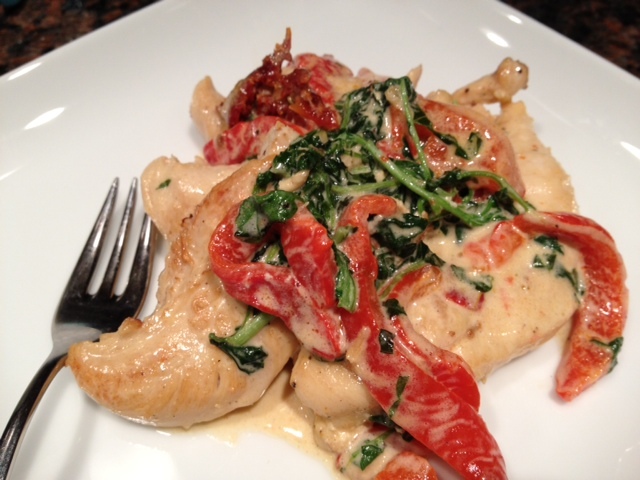 2 tbsp of sundried tomatoes ( preserved in oil) chopped thinly, 1/2 tsp of basil, 1/8 tsp of sea salt, 1/16 tsp of pepper. Trim the haricots verts and place them in the round mold. Cover the mold with the octogonal silpat and microwave for 6 minutes. Uncover the round mold, add all the ingredients mentioned above and stir well. 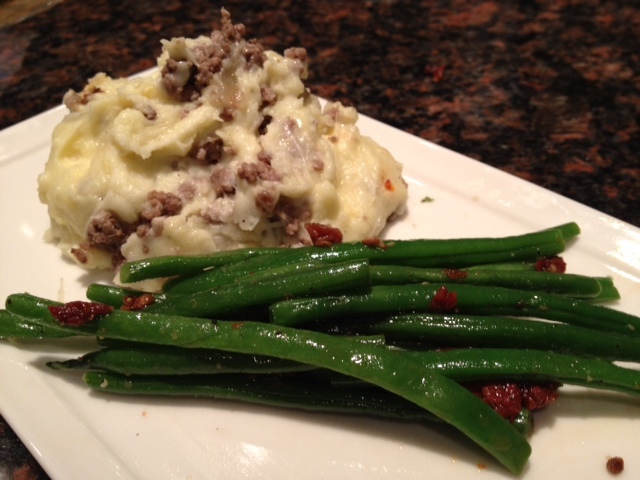 To serve, spoon the hachi parmentier on the plate, add a few haricots verts and serve. If only I could win at the lottery and spend the rest of my days playing in my kitchen, trying on recipes… Everytime I go to the grocery store, I always find something that appeals to me and that I buy. Two days ago were Meyers Lemons, and yesterday was Mahi Mahi. I found some at Costco. Can you believe that?!?!. My daughter even makes fun of me now because when I exited the store, I told the clerk about the mahi. Unfortunately I have not won at the lottery and as many millions of you, I still go to work everyday. So when I come home, I am trying to come up with easy healthy yet delightful recipes that will not take me hours to prepare. I prepared this recipes for several of my cooking classes, and it was always well received so I hope you will give it a try. 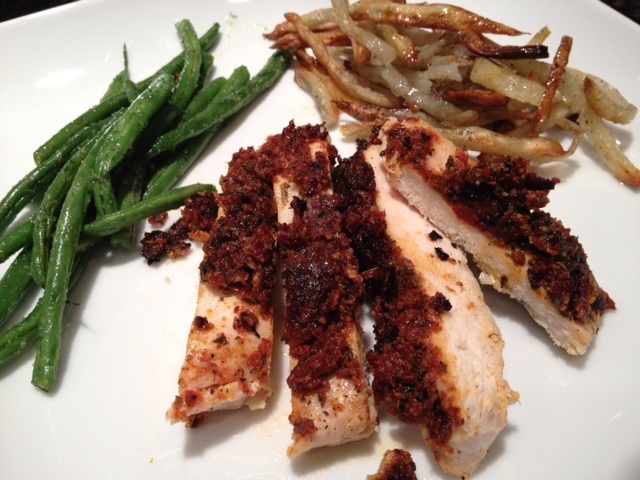 Today I am offering you a recipe of Sun-dried Tomatoes, and Parmesan Coated Chicken with steamed Green beans and Truffle Oil Pomme frites. 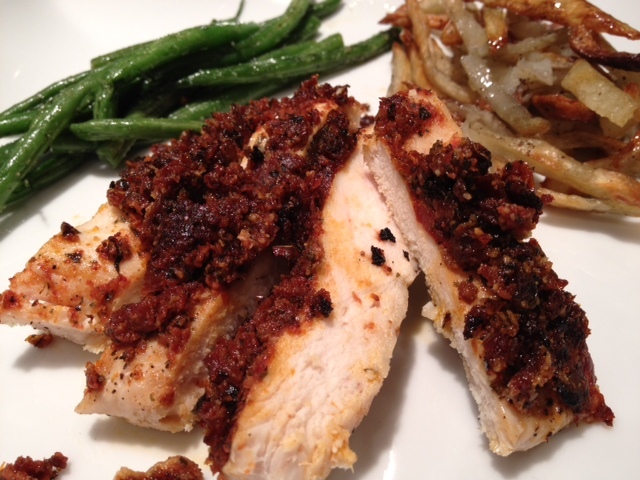 Sun-dried Tomatoes Coated Chicken:1 chicken breast for 2 people, (2 tbsp of sun-dried tomatoes, 1 tbsp of parmesan, 1/2 tsp of brown sugar, 1/16 tsp of salt, 1/32 tsp of pepper, 1/2 tsp of basil ) per breast, salt and pepper. First pound the chicken so it will be tender. Place the chicken in between the roulpat and with the rolling pin, beat the chicken until it is flat and even. Place the chicken on the deep flexipan and season the chicken with salt and pepper by sprinkling it lightly. Set the chicken aside. In a small chopper, place 2 tbsp of sun-dried tomatoes, 1 tbsp of Parmesan, 1/16 tsp of salt, 1/32 tsp of pepper per chicken breast. Chop this mixture well and coat the chicken with it. Cook in oven at 400 for 12-15 minutes. We cook 4 breasts in 15 minutes!!! Trim the end of the beans and place them in the large round mold. Cover the round mold with the octogonal silpat. Cook in microwave between 5- 7 minutes depending how crunchy you like your beans. Season with 1 tbsp of olive oil, 1/2 tsp of dill demarle seasoning sea salt and pepper. Truffle Fries: 1 medium-sized potato per person, truffle oil, salt and pepper. Cut the potatoes in very thin rectangles about 1/3 of 1 inch. Place the fries in a large towel and rub them to dry them up. Add 2 tbsp of truffle oil. Cook in a warm oven at 450 for 15-20 minutes. Make sure to stir the fries during the baking so that the fries are gold on all sides. Before eating, drizzle 1 tbsp of truffle oil over the potatoes and sprinkle with sea salt and enjoy!